« Schizophrenia – a work in progress? 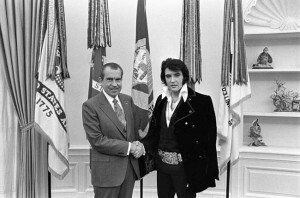 Elvis Presley visited President Nixon in 1970 to talk to him about, amongst other things, the evils of the drug culture. The picture of them together is one of the most popular in the national archive. Why can’t we all, all just be honest? Now how can we start to tackle the problem? At the risk of spoiling her fun, I’ve read through these lyrics a few times and I’m not sure of the point that Allen is trying to make. It’s undoubtedly a tricky subject; witness the scolding that David Nutt recently received from the Home Secretary. With this in mind, perhaps we should congratulate Allen for attempting to tackle such a difficult subject within the confines of a four minute sugary pop coating. But it’s a shame then that her undoubtedly noble intentions have fallen foul for want of a bit of homework. By my reading Allen’s essential points are threefold: ‘everyone’ does drugs, we’re not honest about this, there is no real distinction between psychoactive drugs that your doctor might prescribe and those you might get from whichever drug dealing, bmx riding youngster happens to be passing by. I suspect that in Allen’s circles everyone is probably using drugs and staying up all night, which might account for the obvious world weariness of her first verse. However taking the population as a whole – which crucially includes people who have proper jobs, the best evidence (pg 34 onwards) suggests that around a third of all UK 16-59 year old have used illicit drugs; that’s two thirds short of ‘everyone’. Additionally 2.4% of 16-59 used either crack or cocaine powder in the past year, which means that Allen’s scenario whereby someone might go to their doctor for antidepressants whilst also using crack is a scenario which applies to an even smaller number of people. And I do have sympathy for her assertion that there are double standards concerning drug use. Many prominent people are no more honest about their drug use than they are about the extent of their plastic surgery. PM in waiting David Cameron has refused to discuss his own drug past, saying that he is entitled to a ‘private life’ prior to his entering politics. Home secretary Jacqui Smith has admitted smoking cannabis, as have other prominent politicians. It is true that your doctor can prescribe drugs of abuse, for instance benzodiazepines, and even heroin under much more restrictive circumstances. We can also prescribe psychoactive drugs such as antidepressants. Some people are keener on the idea of this than others. I would draw a distinction between these two circumstances on the basis of intent. A doctor intends to alleviate distress with his/her prescriptions, helping to reduce sleep problems or improve mood. Recreational drugs are just that – an indulgence. This entry was posted on Friday, May 8th, 2009 at 1:39 pm	and is filed under Drugs and drugs policy. You can follow any responses to this entry through the RSS 2.0 feed. You can leave a response, or trackback from your own site. Another distinction might be the rationale given along with the drugs. A GP or psychiatrist might say take medication X because there is a chemical imbalance in your brain causing condition Y – and X will fix it. Drug-dealers, on the other hand, are generally much more agnostic about such matters. it really gets me when celebrities speak of their drug consumption with such freedom and ease. as if it is a good thing to do. i am sorry, i am no expert here, but during my bouts of involuntary stays in psych wards i got to meet some really young people who had their psychotic symptoms brought about because they started to get heavily involved with taking marijuana. i am a schizophrenic myself (no, never took drugs!) and i just wished the youngsters could see the hell that i and people like me go through every single day of our lives… then just ask this simple question of themselves before playing Russian roulette with drugs: does getting high really worth the risk? I think the song is about how everyone is using something to cope with daily life, not just drugs. It does seem like there are very few people around who don’t use something to help them cope; food, drink, tobacco, drugs, psychiatric drugs, and so on. Lily is right that it’s a problem, but the focus is too much on demonising one or other of these “addictions” rather than looking at why we all need something to help us cope in the first place.